I’m sorry to see that your long, lovely letter was postmarked March 12th. Since it was sent directly to my publisher, I can only surmise that it languished there for many weeks before finally reaching my home in upstate, NY. So, please forgive the delay. You do remember writing to me, don’t you? It’s so interesting to learn that you “love writing” but “hate reading.” Usually the two things go hand in glove. I wonder if you’ve been reading the wrong books? In any event, I’m glad that you enjoyed Bystander. Books have given me so much pleasure in my life, I’d hate to think you’d miss out on the fun. Don’t give up on books!!! To answer your questions: I have three children, now ages 21, 14, and 13. 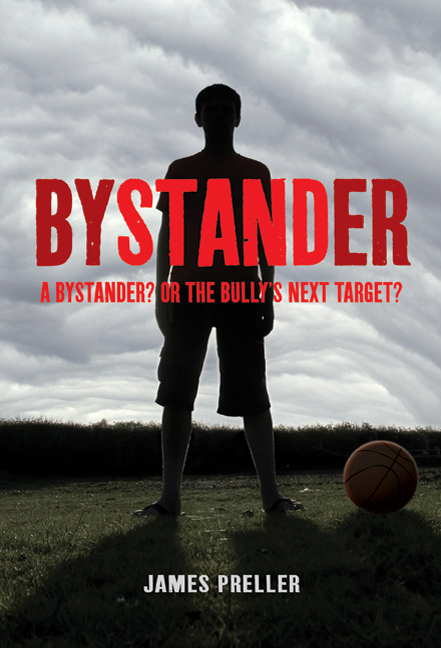 When I wrote Bystander, about 5 years ago, I guess I was beginning to project my own youngest two children in that middle grade environment. In conversations with my editor, Liz Szabla, we often got around to the topic of bullying and what we felt were unsatisfactory, unrealistic attitudes about it. Together we felt that it would be a good topic for me, because I’m sort of an anti-Disney type writer. It’s not all cupcakes, rainbows, home runs and unicorns with me. I set the book on Long Island because I grew up there. It was a familiar environment and, for some reason, I placed this particular book there. At the same time, I’m currently writing one of my SCARY TALES books and it’s set in a swamp in southeast Texas –- and I’ve never spent a minute in that area. I had to learn and research as I wrote, which can also be fun. I was never bullied in my life, nor was I a bully. I was a bystander, like so many of us, and that’s partly why I wrote the book from that perspective.